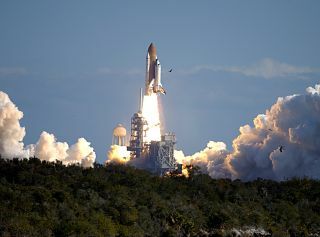 CAPE CANAVERAL, Fla. — A trio of new records were burned into the history books this week during shuttle Columbia's marathon research mission, officials said Thursday. Setting fires within an enclosed chamber inside the Spacehab research module, astronauts were able to spark tiny balls of flame in a mix of extremely small amounts of hydrogen and air. "It's been a great experiment to date," said Paul Ronney, principal investigator of the Combustion Module experiment from the University of Southern California. Results of the experiments could lead to more fuel efficient cars and less air pollution. Invisible to the naked eye, the combustion activity was captured by special cameras able to detect the faint amounts of light and heat coming from flames that ranged in size from five to 10 millimeters. The record for the weakest flame ever burned in space or on the ground. A flame ball was measured to have one-half watt of power, 100 times weaker than a simple birthday candle. The record for a flame produced with the least amount of fuel mixed with air. Only 8 percent of hydrogen was in the mixture. The leanest fuel mixture used in cars is about 70 percent, Ronney said. The record for the longest duration run of a combustion experiment in space at 20 minutes, 12 minutes longer than the previous record marked during a 1997 shuttle mission that included the same study. "I guess you could also say maybe the most excitement by a combustion researcher. Is that a record too?" Ronney said. Data captured during the experiments will help scientists build better models of the combustion process as it happens with very little, very lean fuel and air mixtures. "We've known for over a hundred years that if a mixture is too weak, has too little fuel mixed with air, it won't burn," Ronney said. "But what we've found is that all knowledge we've had up to this point has been tainted." Gravity makes all the difference. In gravity, as a flame burns, the hot air rises and cooler air flows in from below and disturbs the combustion process. If there isn't a lot of fuel, just that little amount of airflow can be enough to snuff out the fire. Without gravity, the fire persists and gives scientists extra time to study what's happening. "The goal is not to use flame balls in our car engines, the goal is to learn more about weak combustion so we can better model what goes on inside our car engines," Ronney said. "We know that if we could burn leaner mixtures, weaker mixtures in our car engines, that we could get higher fuel efficiency and lower pollutant formation." Three runs of the experiment have taken place aboard Columbia so far and additional tests are planned. Other combustion-related experiments will use the same hardware and study ways to lower the amount of soot created when something burns, as well as to study more efficient ways to extinguish fires. Launched Jan. 16 from the Kennedy Space Center, the STS-107 mission will reach its half-way mark on Friday. The orbiter is scheduled to return to Florida on Feb. 1, landing at 9:17 a.m. EST (1417 GMT).